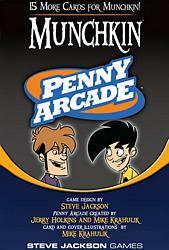 Munchkin Penny Arcade is based on Jerry Holkins' and Mike Krahulik's webcomic, Penny Arcade. Now the fun and the blowtorch come to the game table! With Mike Krahulik's "Gabe and Tycho" images, and card text by Steve Jackson, Munchkin Penny Arcade will make your Munchkin game just a little more surreal.